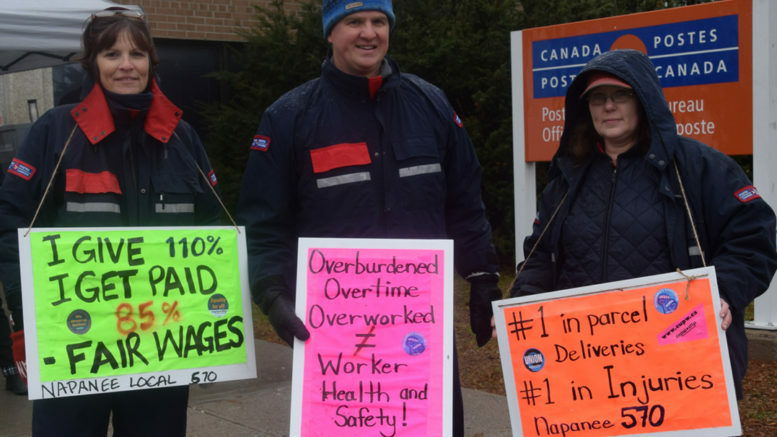 Members of CUPW Local 570 picketed outside the Napanee Post Office on Tuesday to show their displeasure at being ordered back to work by the government. Staff picketed right up until Bill C-89’s noon deadline and then returned to their job. Photo by Adam Prudhomme. Napanee’s CUPW Local 570 postal workers held one more picket outside the town’s post office on Tuesday morning before returning to work at noon. The site was similar across the country as postal workers voiced their displeasure right up to the final minute before legislation kicked in, ordering the workers to end six weeks of rotating strikes. Senators voted Monday 53 to 25, with four senators abstaining, to pass Bill C-89, which forces CUPW back to work. The bill carries with it fines of $1,000 to $50,000 per day to anyone found disobeying the ruling and up to $100,000 to Canada Post or the union if they are caught disobeying its terms. Buxton says workers weren’t pleased to see the government step in and pass the bill. At the heart of the issue is the union demanding better pay and job security, guaranteed hours, equal pay and safer working conditions. Though the government ordered them back to work, they didn’t address any of the union’s concerns. Though they returned to work Tuesday, Buxton says they plan to continue to fight for what they feel is right.